Please see 「岡山大学学術成果リポジトリ登録要項」(Japanese Language only) - guideline for the operation of OUSAR. Please check the Notes (留意事項)(Japanese Language only). - Please tell us about the work (specified below) by email or mail. - Please submit your work to us by email or mail. 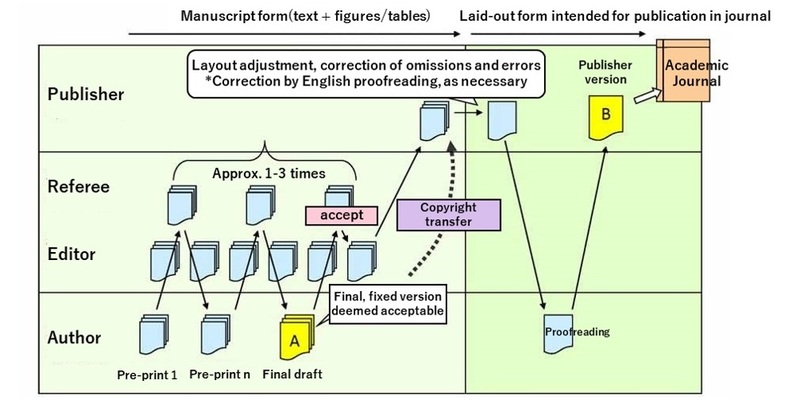 Did (or Will) you transfer copyright of the work to others? Do co-author(s) consent to the self-archiving of the work in OUSAR and making it publicly accessible? I consent to the self-archiving of the work in OUSAR and making it publicly accessible. - Okayama University academic research staff can also submit to OUSAR from "Academic Research Staff" databese input page. not the version laid out by the publisher. - Deposit the work in OUSAR and make it publicly accessible. - Send e-mail to notify the completion of self-archiving procedure.